“Paul, an apostle of Christ Jesus by the will of God, and Timothy our brother, to the saints and faithful brothers in Christ at Colossae” (Col. 1:1-2). As we learned in last year’s study of the new covenant’s fulfillment of the old, Jesus is the center of Scripture, the one in whom “all the promises of God” are “Yes” and “Amen, to God for his glory” (2 Cor. 1:20). It is thus fitting that we pick up on this theme in the first book we are covering in Tabletalk’s 2011 daily studies — Paul’s epistle to the Colossians. This letter emphasizes the supremacy of the Christ so clearly that there can be no denying the central place Jesus holds in Christian orthodoxy. Colossians was probably the first letter written in the group of writings commonly known as Paul’s “Prison Epistles.” This grouping also includes Ephesians, Philippians, and Philemon, all of which were penned while the apostle was serving time in prison for the gospel. Although Paul was clearly behind bars when he wrote to the church at Colossae (4:3, 10, 18), it is impossible at the present time to determine whether he was chained in Rome, Ephesus, or some other city. Knowing the locale of his imprisonment, however, is of almost no consequence to interpreting the epistle. Colossians was probably written around AD 60, before some of Paul’s other extant — existing — correspondence, including his letters to Timothy and Titus. Today, many critics deny that Paul wrote Colossians, attributing it to a later Christian who wrote under Paul’s name. This is largely due to the letter’s emphasis on the “cosmic Christ,” which, they argue, was not an early Christian doctrine. In Colossians, the Son is deemed co-equal and co-eternal with the Father as well as the creative agent of God. We also see the church thought of in terms of the universal body of Christ rather than merely a collection of loosely-affiliated congregations. Such emphases, the deniers of Pauline authorship assert, are inconsistent with Paul’s other letters. Yet this position reflects inconsistency. Paul elsewhere proclaims the “cosmic Christ” and depicts the worldwide church with Christ as its head (see Phil. 2:10; 1 Cor. 12). Add to this the fact that no second-century church father doubted Pauline authorship, and we have no good reason to question his writing of this epistle. The letter emphasizes the preeminence of Christ, largely due to the false teachings gaining ground in the Colossian church. We will see what those were in the coming days. Take some time today to read through the book of Colossians in preparation for our study over the next few months. Ask the Holy Spirit to help you understand this important letter and to grant all of us who are studying together the wisdom to apply its teaching today. 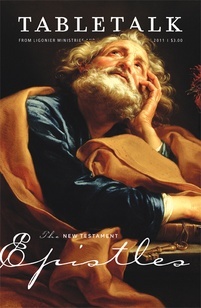 Consider selecting one passage from the book and meditating on it that you might be prepared to see how it fits within the overall argument of Paul’s epistle.